You are here: Home / Bearing Basics / How do I determine the loads on a bearing? How do I determine the loads on a bearing? Matt McCormack, applications engineer for SKF gives us a little insight into what design engineers are frequently asking him. Here, he focuses on the basics of determining the loads on a bearing system. Often, our customers want to know how to I determine the load a bearing will encounter? Commonly, customers think of what the weight of a component is on the bearing (weight of the shaft for example) and they ignore manhy other influencing loads that are on the bearing. So when we talk about loads on the bearing, we’re talking about the reaction load at the given position. So here we have a shaft and we have a ball bearing, and the radial load is the load that’s perpendicular to the shift. So it doesn’t matter if the shaft is going towards vertical. The radial load will always be perpendicular to the actions of the shaft. The axial load and the thrust load will be parallel to the axis. And if you ever combine those situations, then you can have both radial and axial. As an example, here is an industrial fan. This is a very large fan to move air. A hotel has many industrial fans in it, hospitals, schools, any large building where you need to move air for heating, cooling or ventilation, you’ll find somethng like this. The large cylinder portion is where the big fan blade is and at the top there is a box where where the buffer will be attached to this fan to move the air through it. All of this is being driven by an electric motor. The electric motor is belt driven from the fan shaft, so you have a buffer to cut between the pulley and the belt. You can’t see it, but there’s a pulley system and a belt and then there’s two bearings supporting this fan shaft. So, this shaft weighs 150 pounds and it’s cradled essentially on these two bearings supporting on both. When you drive, you drive the belt, the belt will tension to this pulley, or there’s some kind of stretching dimension port that’s putting a radial load on the pulley. The last loading is coming from the work that the collar is doing. This fan is pushing a large amount of air with great force to get it through the duct work to make it go throughout a building. So any force this fan collar is pushing, there’s an equal reaction force that’s happening on the bearing inside this yellow point, obviously. 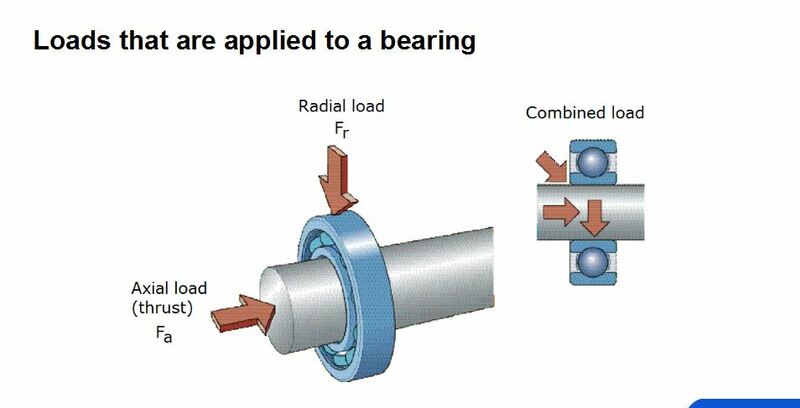 Those are the three basic load components on the bearing. We have to consider the weight of the component, the force and the drive forces. In this case it was a belt, but it could be chain driven or gear driven. And then you have the fly bills. If we know the distances, we can use stats to determine the load on the bearing. We can calculate whether they both are load bearing solutions. There’s also loads that don’t necessarily think to consider. Like in the case of the fan, there might be imbalance loads. So if the fan is not in balance, it wasn’t balanced properly when they first installed it, or if they’re aware over time it starts to become imbalanced, those imbalances will increase the load behind the bearing, and then any misalignment. If that pulley was misaligned or the belt was misaligned during initial setup, that can cause misalignment to load down the bearing. So these are the loadings that we’re talking about. This is the stuff that we’re after when we’re sizing the bearing. It’s important not to just think of the weight, because many customers just think in terms of “what’s the weight?” There are other options that need to be considered.